I have had a new digital camera for over a month now, and I recently and belatedly transferred a batch of images from the camera into the computer. I have been editing them today. This image began as one of the first few photos that I took. 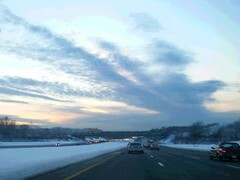 This was on January 15, on Route 128 near Danvers, Massachusetts, on the way to New Hampshire. It was around 4:30 which is when the sun starts to set in mid-January, up here north of Boston. The sky was amazing so I decided to take some photos. One test of a good camera for me is how well it does at taking pictures from a moving car, which is something I often do (only when I am a passenger!). I took several pictures within few minutes, and this is the first one of them. Tonight I cropped this image out of the original photo to eliminate the interior of the car. But I left in the highway and the cars. I like the juxtaposition of the lyrical sunset with the view of the freeway. This is how most of us see the scenery these days. Ever since I was a kid, I have liked the look of car lights, especially bright red brake lights, and in this case, I think they add to the composition. I decided to try posterizing the image just a bit, so I opened it in Painter IX. I liked the result, and here it is.